It was my friend's Birthday in July so I made her a card. No, not cross stitched for a change! My friend loves rubber duckies so when I saw these little ones on Ebay I knew they would be perfect for her. The fabric I covered the card with is the one I will be using to back July's JBW cat ornie too. I had an outpatient's appointment this morning so I took this along. 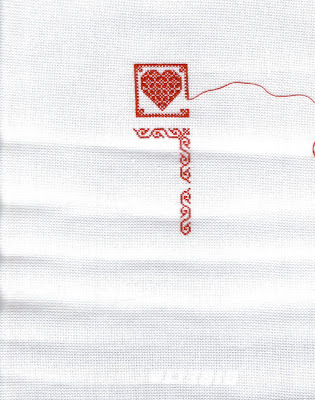 I stitched an entire heart while waiting!! A very nice elderly lady came by with her grand-daughter and asked to have a look. She was most impressed as was the girl's mother who recognised it as cross stitch. Yes, not knitting or crochet but genuine cross stitch! The lady did not have a long wait so I said "I think I'll come to your clinic instead". She replied "oh no, I go to the silly clinic because I do daft things sometimes". It did remind me of the many trips to the hospital with my Nana over the years. She would always kiss the nurses goodbye and insist on tea and cake in the cafe saying "Well, we've had a nice day out". So, what's coming up next month? Did you know that eating local honey can help with hayfever and pollen related asthma? Finally the good news is my friend said I may pass on some of her designs to my blogging friends. They are mostly small pieces suitable for ornies or box tops, there are some nice sunset designs and a lovely set of seasonal samplers, again quite small. I'm thinking about doing a SAL for those starting with Winter in January 2014. I'll post a picture soon and see who is interested. July's kitty is a beach themed kitty, sandy yellow on a blue sea. I have some seashells to add to it and some nice sea themed fabric to back it. I haven't stitched a Hallowe'en ornie this month because I've been busy with my cousin's wedding sampler. Maybe I'll do two next month. And two for the Needlecraft Haven challenge too! I say "was" because it is currently residing in my kitchen! She is no longer able to stitch so has gifted me her entire box of supplies including what appears to be the whole range of Anchor threads. The unbagged ones are here, the rest are in Flossaway bags already. I'm a DMC gal myself but I intend to use these for smalls and ornies, saving my DMC for larger projects where I am more likely to use up a skein. Given the price of thread in the UK this will be a huge saving for me. There is also alot of aida and some evenweave including some lovely Permin lilacs and purple. 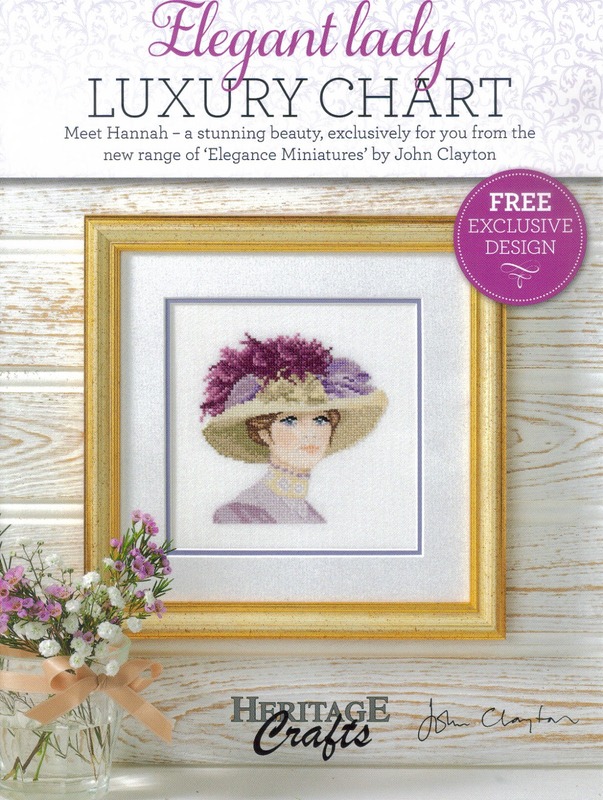 Plus some kits and charts including a range designed by my friend herself as part of a fledgling career as a designer. Stay tuned to see where Clare's card goes to. Don't forget to leave a comment on each blog so they know you've been a'visiting! ps this is my 250th post!! 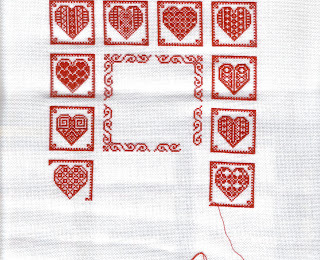 I've been stitching away on my little Hearts sampler this week, daytime and evening as I want to get it finished in good time to be framed and wrapped. I've actually completed the pink row and started the blue outline of the row above now. Apart from that I've been adding a new page to my Happy Dance Blog (see top tab) for all my scrapbooked finishes to have them all in one place. I've been ebaying some old magazines to raise a little stash-cash, tidying the accumulated piles of school detritus, making a FB page for hubby's business, going to work and listening to whatever video clip the Small Boy has settled on for the day. The Direct Line advert is a great favourite today as is Peppa Pig in foreign. At least it's better than the rude over dubbed version he found last week. Good job he can't speak and repeat the Geordie swearwords! 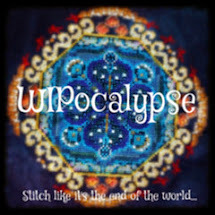 The main focus of my WIPocalypse this year is supposed to be my "13 in '13" a list of 13 projects I want to complete in 2013, click on top tab for the list. But as I haven't stitched on any of them this month I'll show something else from the other sections instead! 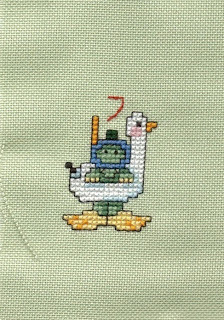 I've been stitching some of the designs from the Joan Elliott diary which was a cover gift with World of Cross Stitching magazine last year. I have completed three, January, April and June and have now mounted them for inclusion in my scrapbook. February is nearly finished but has been put aside for next February so I can try stick to the relevant month. 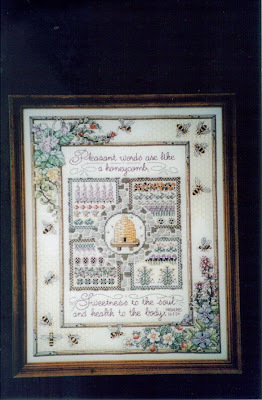 And here is the Needlecraft Haven May Challenge piece from The Little Stitcher. I added the stripy shoes embellishment because of course, we were all singing Ding Dong the Witch is Dead as we stitched this piece! 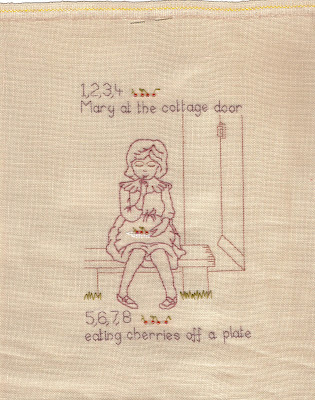 In this case she has been killed by cross stitch. The lovely scrapbook papers came from a new-to-me online scrapbook shop I found by Googling "Wizard of Oz scrapbook". The site is called Scrapping the Magic and is rather Disney overload (the owner set it up to sell to people who have visited Disney and want to scrapbook their holiday photos). But if you dig around the mouse droppings there are some great papers and embellishments. Sorry, I shouldn't be rude about Disney as many people love the company and they are superb at what they do. Trimming the hedges at Eurodisney with a wood template to ensure each one is exactly the same is dedication to detail! The papers arrived very quickly, solidly packaged in a stiff cardboard box 12x12 so there was no way the postman could bend them. Prices are very reasonable and I will definitely be using them again. There is lots of advice for the newbie scrapbooker on the site and also a monthly competition. Use their template to create a page on their theme and send it in. Three done, nine to go. Mii left a comment on the last post to say she has stitched this design too. Of course when I went and looked at her blog Mii Stitch I remembered that is how I found the chart myself! Thanks for the inspiration Mii. He's the seventh in the Twelve Dragonlets of Christmas series by Dragon Dreams released as an exclusive on their Facebook page. He is the Large Boy's favourite so far. 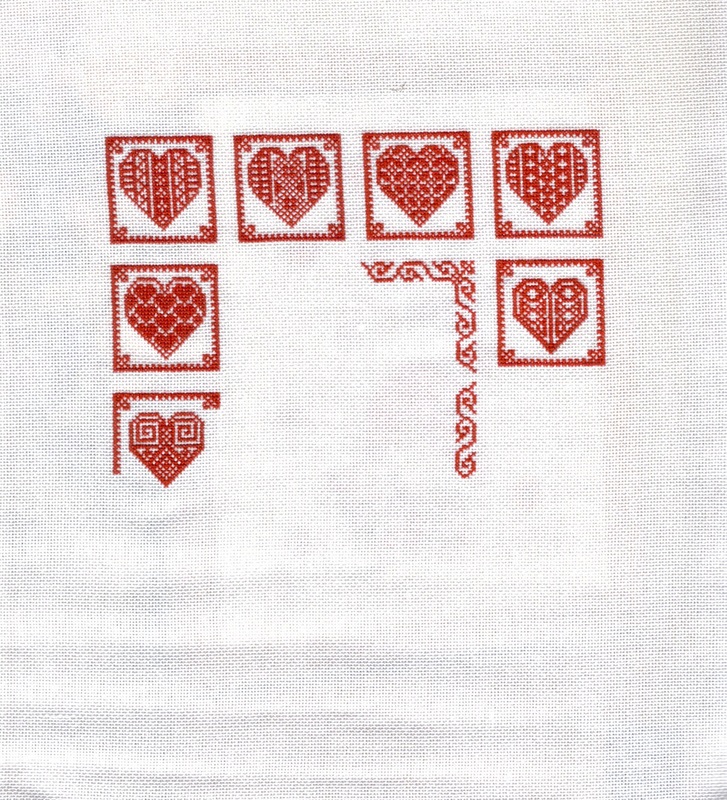 This is a new start, it's going to be a Wedding Sampler. 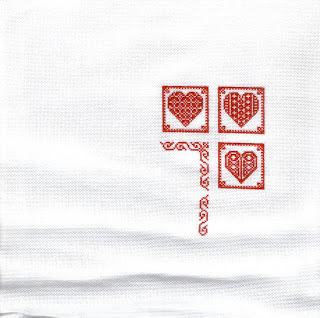 One heart done, 11 to go. It's a freebie I downloaded and labelled as "Marie Carton" which I think is a French blog but the bookmark must be on the old computer! OK, I've done a little googling and here is the link for Coeurs en Boites. I'm stitching on 28 count white evenweave using 1 thread of DMC 304. I also finally reached the far side of my Scarlet Letter Sampler. 14 inches across altogether. Phew! I can either start filling in or move on to the outlining of the next band up. If you're joining in, don't forget to include a little message on the theme of "Home". All details click on the "No Place Like Home" photo on the right side bar. It's nearly the end of term here in England so both boys will be moving on. The Large Boy has been taught by his current duo before so they both have samplers already (see these posts). They will be getting a book each instead. The Smal Boy is leaving his Playgroup to start School, four days a week at the Special School he already attends and one day at his Big Brother's School. I have bought books for all the Playgroup Workers but his Keyworker deserves a stitched present too. Quite frankly, they all deserve a bottle of wine and some valium as well but she's getting something stitched! I just sketched her onto graph paper then backstitched onto 28count linen. I added some little beads for the cherries and now I have to frame her. 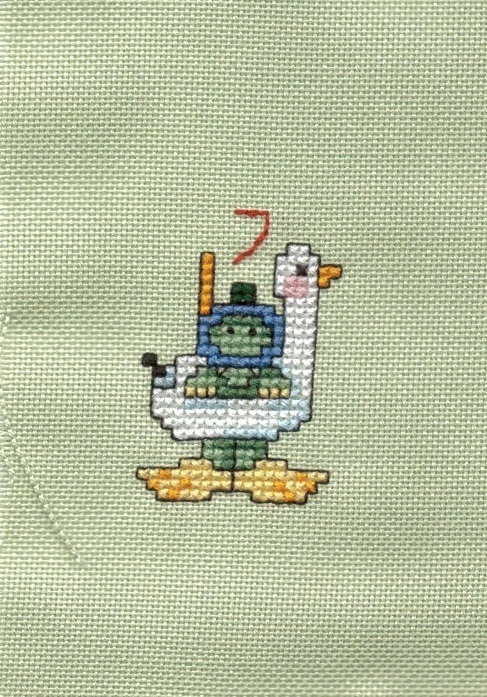 That's it for themed stitching so far this month! Finally, a mini-giveaway. I received my 4000th comment recently, wow! Yes they are all from real people, I don't get spam and I don't comment on my own blog in reply to comments, I do them by email. So 4000 comments is amazing. Predictably the Giveaway posts attract the most comments (60 on the Easter Treasure Hunt and 44 on my Blogaversary) but this post had 33 comments simply because I asked for your advice. Hint to new bloggers; people love to give their opinion on stitching decisions. Unfortunately, if there are three options votes will be split over them plus someone will throw in a fourth option so you're not really any better off but at least you have comments LOL. Anyway I have this lovely John Clayton chart to send to a friend. 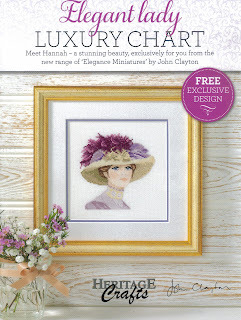 It is the cover gift from World of Cross Stitching magazine this month, although it is not my style I'm sure someone will love her. All you need to do is leave a comment saying why you'd like to receive her and I will choose one person on the 22nd July. I have just completed my Joan Elliott Wizard this afternoon. I made a few changes to the threads, mostly changing plain DMC to the metallics, in the stars, swirls and the orb at the end of his wand. I also changed the confetti around the swirls to beads. The fabric is a Crafty Kitten grab bag piece of 28 count linen. Quite a loose weave so I had to be careful with the beads and metallics not to pull the threads of the linen out of shape. I intend to scrapbook the design once I find the right paper for him. 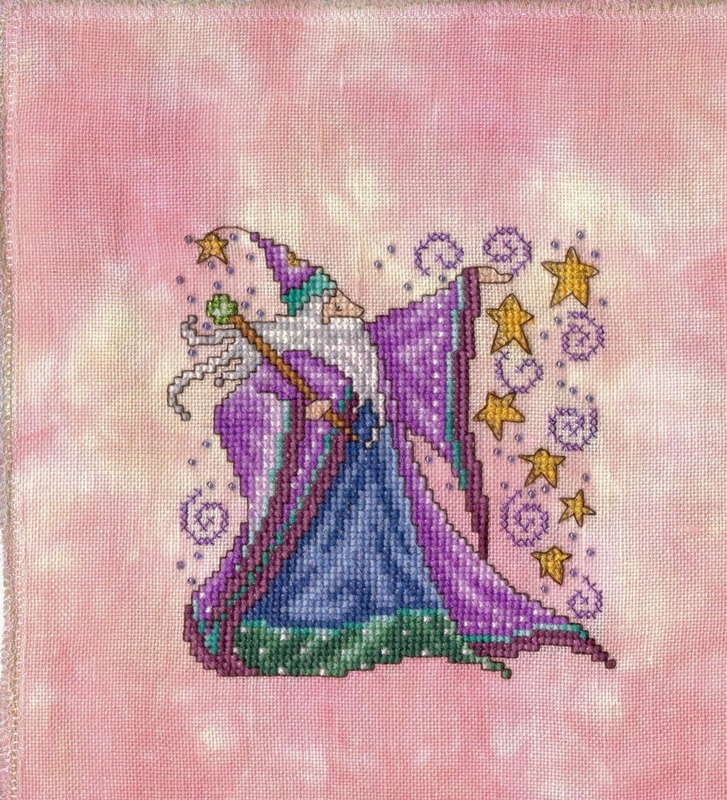 This is the third piece I have finished from the Diary which was the cover gift on orld of Cross Stitching magazine last year. 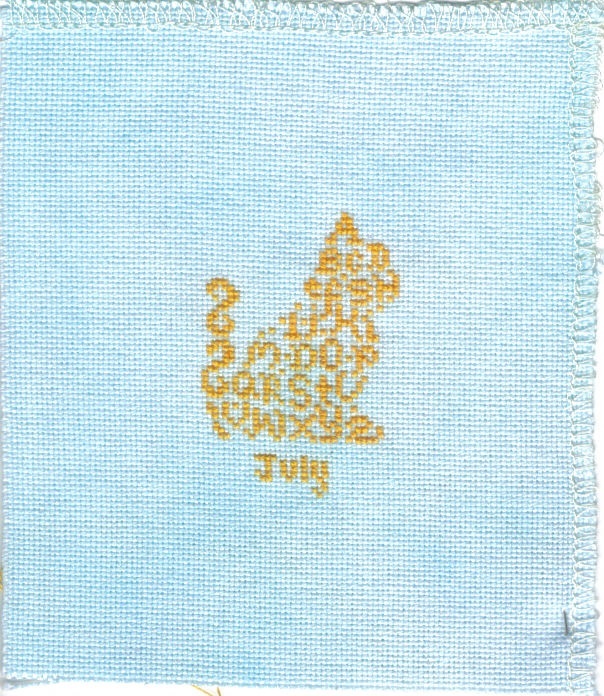 I have also stitched about 75% of the February cherub. The next design is the July Mermaid but I don't have the right fabric for her nor do I have any for August or September!! So I suppose I better do some shopping soon. I finished the Dragon Dreams 7th Dragonlet of Christmas in 2 days flat but don't have a photo yet so I'll save it for Ornie Update Day. July's TUSAL features the photo I sent out to Debbie for the Summer Postcard Blog Hop, a CCN design called Cherry Hill Cottage. 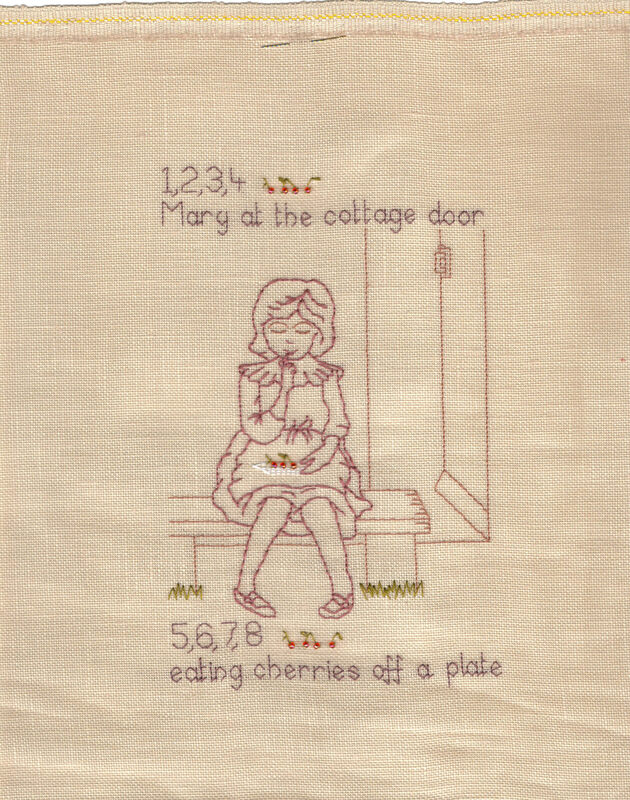 The current stitching alongside is a piece of my own design which will also feature cherries. Full details to follow when I finish it! The little round tin was a cover gift from magazine (probably Cross Stitcher) and I use it for my travelling ORTs. It's also a useful paperweight, because I stitch in hand the bottom of my fabric is always curling up. 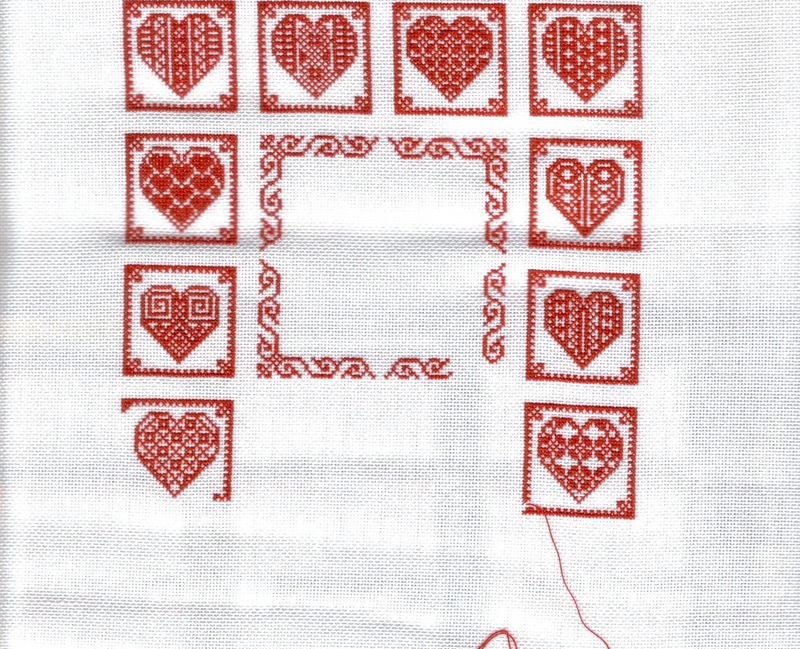 This is the English Transitional Sampler and it's a long slow process stitching all the outline. The filling in should be easier and quicker too! I'm stitching this as part of Nicola's Scarlet Letter Year. A project we set in motion last November to celebrate a milestone Birthday for Nicola in February. 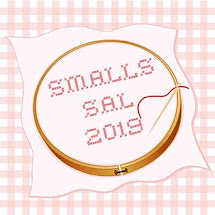 The blog went stratospheric and we have over 200 stitchers contributing now. 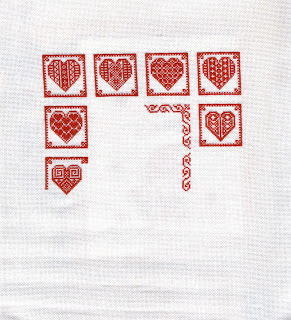 There's always room for one more though, so if you have a hankering to stitch a reproduction sampler, or one of Marsha's own designs then pop over to the Scarlet Letter Year Blogs (One and Two) and find out more. Alternatively, just come and follow us to enjoy the beautiful stitching. 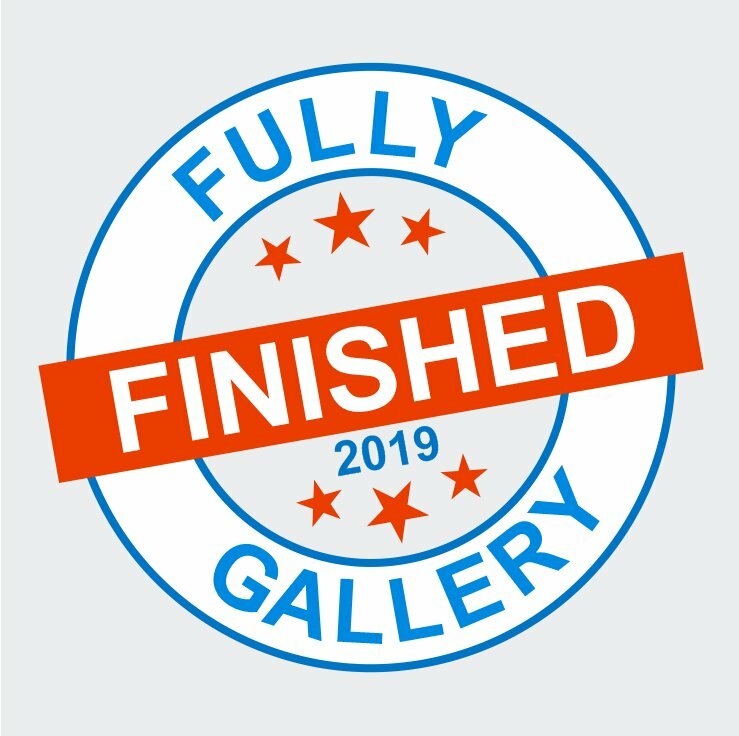 We have a page just for Finishes (over eighty so far) and a page of useful Hints and Tips including links to the interviews with various celebrity stitchers. Finally, remember I was having problems getting my subscription to JCS renewed because the computer wouldn't accept UK as a valid country? I kept getting emails offering me a free issue if I signed up so I set up my address choosing Europe Military as the country (presumably intended for servicemen and women?) then when I got the email confirmation I just asked them to amend my country to UK which they did and the magazine arrived a couple of weeks later with an invoice. So we shall see if my subscription continues smoothly from now on. Debbie is the lucky recipient of the first postcard in this Summer's Blog Hop. 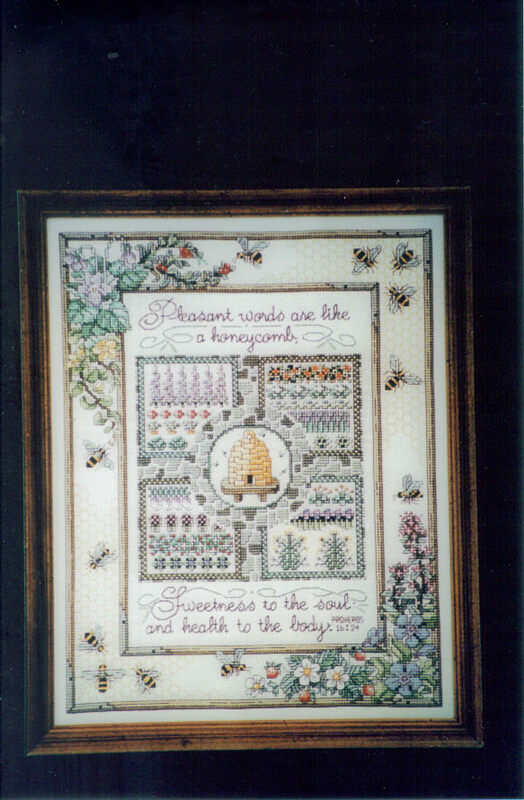 You can see the card she received on this post on her blog Debbie's Cross Stitch. 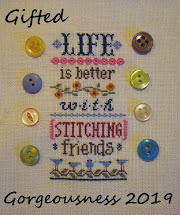 In another week's Debbie's postcard will be sent to the next person in the Blog Hop. Who will that be? The Hop will run all Summer so there's plenty of time to sign up and take part. Just click on the There's No Place Like Home photo on the right hand side bar. Do you ever get the urge for a completely new start that isn't on any of your lists or schedules? When I finished the Mira RR I should have gone back to something on my 13 in '13 list but instead this little beauty and her sisters were calling to me. Remember a while back I bought three of this Shepherd's Bush series to complement the four Christmas themed ones I already had? Then Laura generously sent me five more to complete the series. Or so I thought, until Heather sent me four more! I figured since I now have 12 mini samplers I really ought to make a start on them. But which one? I looked through the Ingredients list and found that nearly all of them use DMC Perle 822 and 644 but I only have White and Ecru. Fortunately there was one exception - Bilberry just uses Ecru. Decision made! 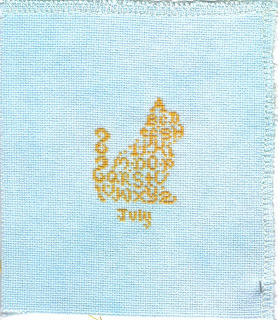 I stitched this piece on 32 count Antique White linen. They didn't have Ivory so originally I tried Antique Ivory but it was far too dark. This is perfect. It only took a few days too. 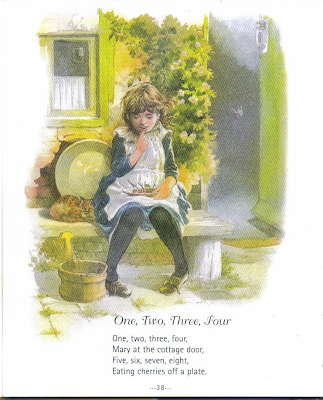 I have framed it in a nice dark wood frame from a chain store (Wilkinsons for the English) which came with a mount. I looked up "bilberries" on Google Images and found a nice woodcut of bilberries which I copied onto the corner of the mount using felt tip pens. Well, we can't all afford Jill Rensel! Finally, I'm using Feedly now Google Reader has gone, I like the computer version more than the App version. That is a little basic. I've got behind again and am speed reading through the older entries to try catch up so sorry if I'm not commenting as much as usual. But I am reading!